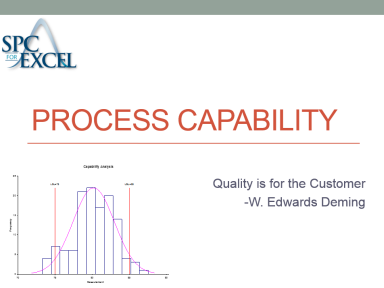 The purpose of this module is to introduce process capability including the definition of process capability for attributes data, the definition of process capability for variables data, and how to calculate process capability (Cp, Cpk, Pp and Ppk). Exercises include determining the process capability for the hardness of steel tubes, the cut length of bars, and particle size distribution. How to determine the % out of specification is included.